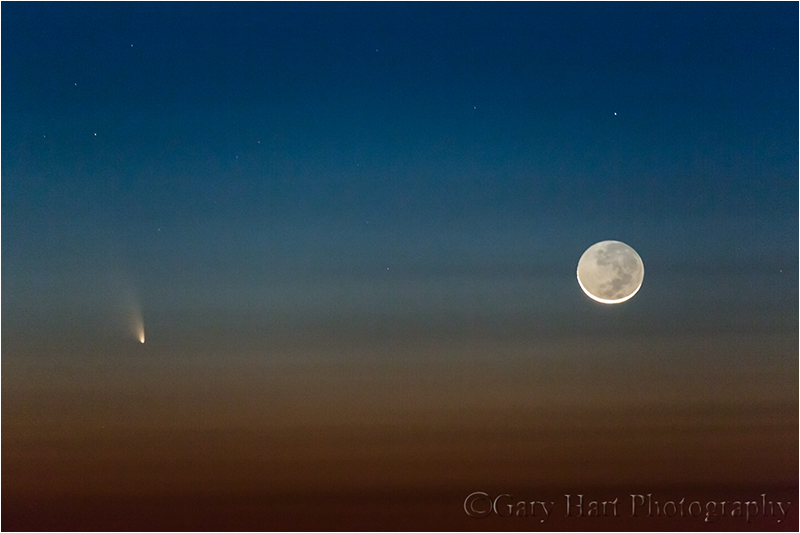 I’ve been a huge comet geek since I was ten years old (details here), so when I heard about Comet PanSTARRS almost a year ago, I was pretty excited. I became even more excited when I learned that PanSTARRS would be a little more than three degrees left of a new moon on March 12. Checking my calendar, I discovered I’d be on Maui that week. Sweet. Fast forward to March 12: I’m on Haleakala, the location of the PanSTARRS telescope that discovered the comet, with my Maui workshop group. After a sunset that colored the swirling clouds in all directions, the clouds close in and completely shut down the sky. We stick it out for a while, but when the cold saps the group’s enthusiasm (it’s 35 degrees with 35 mph winds), I reluctantly honor their wishes. Could I really have gotten so close to this event I’ve been anticipating for nearly a year, only to be denied. Descending the mountain with one eye on the sky, I hope for a break. Less than two miles down the road we suddenly pop into the clear and see a thin slice of moon dangling like a Christmas ornament in the blue/orange band separating day and night. While PanSTARRS isn’t bright enough to be visible the twilight, I know I can use its proximity to the moon to guide my lens. I pull the car over and we yank out our cameras and start firing, wider shots at first, then tighter to zero in on the comet and moon. The amount of light necessary to reveal PanSTARRS also revealed exquisite detail in the shadow area. I’ll write more when I have time but I just had to share. Now, off to Hana…. Holy cow… great capture Gary!!!! Tried last night but it was just too hazy in Sac. Went to the Trinity Church off Country Club Drive off 50. It was a beautiful view of the city lights, but the cloud cover and haze made it nearly impossible. I think we got maybe a tiny bit of it. Anyway, great shot! I had to experience my first comet “raw” first… and this is how my photographic memory sees it! Next I can only hope to capture a shot even close to this! Spectacular! Beautiful and truly a dream fulfilled! I know you do not like this but did you use a 70-200 F2.8 w/ a 2x or was it a 100-400L lens? I am trying to determine what long lens to buy…..I have the 70-200 F4 non-IS but I cannot use the 2x AF. Is it worth buying the 2x? I know you did not use the AF. Thanks for a beautiful image and congratulations!!!!! Thanks, Tom. I used my 100-400 for this. I have a 1.4x teleconverter but never use it. Great shot! I went out to the Delta to try and catch it, but I couldn’t see it with my zoom lens… got some nice sunset and post-sunset shots anyway, though.